Fire! Tornados and tsunamis are terrifyingly destructive, hurricanes and floods are devastating in scope, earthquakes and volcanic explosions change the landscape forever. But a windswept forest fire may be the most frightening natural disaster of all; there’s the heat; there’s the swiftness; there’s the loss of oxygen in the very air we breathe. 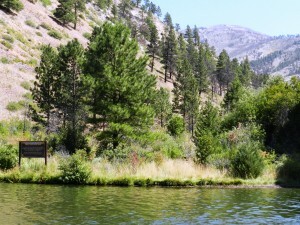 Alongside the Missouri River in the Helena National Forest stands a National Register of Historic Places sign remembering the deadly Mann Gulch fire. It reads: On August 5, 1949 a lightning-caused wildfire entrapped a smokejumper crew in this steep canyon. Before it was controlled it took the lives of 13 men and burned nearly 5,000 acres. 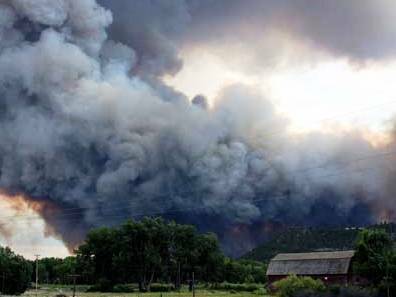 The lessons learned from this tragic event continue to influence wildland fire fighting. 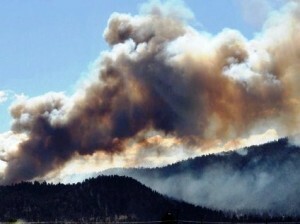 The fire was first reported around noon and the Forest Service dispatched smokejumpers from Missoula to the remote area; two of them were new and inexperienced. Based on the information they had on departure, they had a plan, landing about a half mile from the fire. 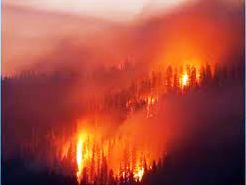 But things quickly changed; high winds caused a blowup; the fire expanded to 3,000 acres in 10 minutes, cutting off their route and forcing them uphill on the steep canyon slopes. With the fire less than 100 yards away, crew foreman Wagner Dodge set a small “escape” fire, creating a burned-over area that the fire would bypass. 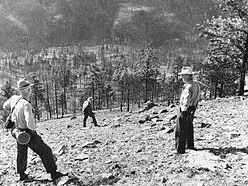 He directed the group to the area, but in the confusion they continued going up the steep incline away from the fire. The two newest, Walter Rumsey and Robert Sallee, found shelter inside a small crevice in the canyon’s rock wall. These three were the only survivors; the rest of the crew, it was determined later, suffocated and fell as the fire approached. Dodge lay face down as the fire swept over him; although its force lifted him several times, it quickly passed over the already-burnt area, allowing him to breathe. Many books have been written about the lives lost and lessons learned on that fateful day, including Norman Maclean’s Young Men and Fire (University Of Chicago Press; 1992; ISBN-10: 0226500616); it took him 14 years to write and won a National Book Critics Circle Award. Maclean is a native of Missoula, Montana. I’m ordering a copy for my Kindle today.